This is me showing you that cauliflower crust is dope. Dope as in awesome and nasty as in “Yah brah thats sik!” Shaka sign dope and awesome and sik. Got it? Because there’s really no end to what you (and I) can do with cauli crust. Like really. 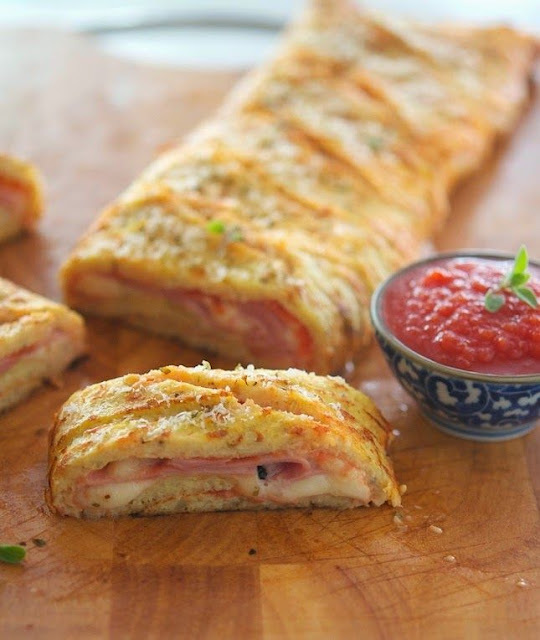 Pizza, calzone, pizzettes, hot pockets, garlic breadsticks and today Stromboli. Now, do you know what Stromboli is? It’s a small island off the north coast of Sicily, containing one of the three active volcanoes in Italy (I've just wikipedied it.) And it’s also a fantastic appetizer. I was first introduced to it a couple of years ago at Scarpetta in Chelsea. It’s part of their bread basket (I still ate bread back then, say what???) and I soon became obsessed with Stromboli.